Stick a Fork In Her. She’s Done. Yesterday was another you-can’t-make-this-stuff-up morning for me, courtesy of The Today Show. A New Jersey mom is accused of causing sunburn to her five-year-old daughter by placing her in a tanning bed. Not even a spray-tan booth, à la Snookie. We’re talking about an old-school tanning bed complete with retina-shielding goggles to prevent, you know, blindness. One of those contraptions that has been linked to premature aging and Melanoma. Impossible, you say? What kind woman would inflict such a thing on a young child? Ladies and gentlemen, I present to you… Patricia Krentcil. I’m traveling for work this week, so at first I thought there was something wrong with my hotel TV. Was the color off? Krentcil is blonde, but has leathery skin the color of an old baseball glove. She could easily be mistaken for Al Jolson in blackface. Perhaps. 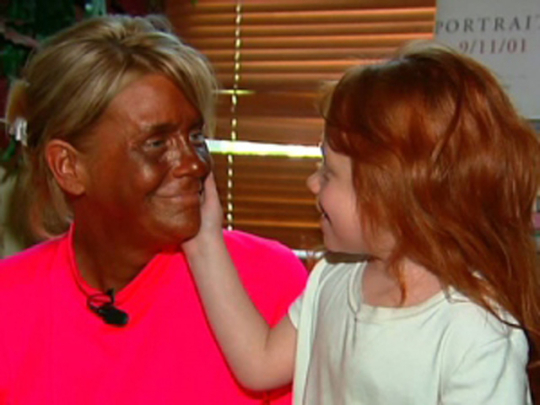 Someone may be addicted to tanning, but that doesn’t mean she would force her five-year-old kid to do it. The funny thing was that everyone on Today kept a perfectly straight face throughout the segment, and no one even pointed out that Patricia Krentcil is (to quote the Associated Press ) “deeply tanned”. Apparently seeking to dispel any hint of bias, the story was presented as sort of a he said/she said situation. As if, due to the lack of circumstantial evidence, we might NEVER know what happened. Never fear, on Day Two of Pigmentgate, Today changed course and invited medical experts — who have never met Krentcil — to speak about the dangers of her ‘tanorexia’. Speaking of blackface (sort of), Ashton Kutcher is in hot water for his appearance in a new Popchips commercial in which he impersonates a Bollywood producer, wearing brownface and using a strong Indian accent. Twitter erupted with charges of racism, and the ad was swiftly pulled. I am completely baffled. This causes outrage, but not Metro PCS commercials that mock Indians using every unflattering stereotype in the book? Those cringe-worthy ads have been going on since 2010! Kutcher’s Popchips performance is not exactly enlightened but Metro PCS commercials are insulting and completely unfunny, and they make me change the channel. Through instances such as the metro PCS commercial and the Jeremy Lin saga, we see that broadcasting/advertising displays a general ignorance to what constitutes racism towards Asian Americans. When I see things like this I hear someone involved saying “Oh, wait, that is racist? Well, live and you learn.” Without more advocates to protect them, Indian Americans will see this scenario played out quite a few more times.